I recently found out that I had been featured, as “Professor Derhy Kurtz”, in the US publication of the Center for University Programs Abroad 2013/2014. ‘The Center for University Programs Abroad (CUPA) is an independent organization founded in New York in 1963 as the Center for Overseas Undergraduate Programs (COUP). CUPA has offices in Paris and the United States. Institutions participating to the CUPA programme, as listed on its website, include some of the most prestigious universities in the world, such as Harvard, Princeton and Yale, but also University of California (UCLA), Johns Hopkins University, University of Michigan or Carnegie Mellon University, all of which are among the top 25 universities in the world, following the Times Higher Education ‘World University Rankings 2013-2014’. It was, therefore, all the more an honour to be featured in a document used by students from such renowned universities who wish to spent some time studying in Paris. 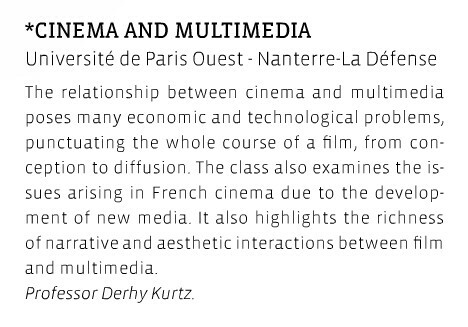 The brief article discusses one of the course I’ve taught at the ‘Arts du Spectacle’ (Film) department of Université Paris Ouest. Here it is as it can be found on page 135 of the pdf or page 133 of the paper version. You can also directly access the entire issue of ‘The Center for University Programs Abroad – Paris 2013/2014‘.